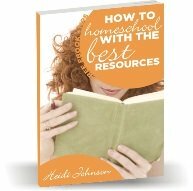 If you're looking for a Sonlight review from a veteran homeschool mom that has seen lots of curriculums and learning styles, then you have come to the right place. Sonlight is a literature based homeschool program. Their products are mostly non-consumable and can be reused for younger children to help save money. Their "Core" packages come with lesson plans and books all gathered for you in one place. You don't have to use the complete Sonlight package and can pick and choose the parts of the program that you want to use. As with any homeschool program, you need to decide what is important to you when looking at what is available. You also need to take into account your child's learning style, how they learn best, and what plans they might have for their future. If you keep in mind that you are looking out for what is best for your child, you should be able to find a program that is a good fit for them (and you). Don't use the controversial books if they bother you. Check the frequently asked questions. Don't use the guide if you don't want to. Plenty of people use the books listed in the Sonlight catalog at their own pace and in their own order. Make up your own quizzes and tests if you feel that there are not enough tests. Or you can type out the oral comprehension questions and have your child answer them on paper. If you don't want to spend as much time doing school work as the guides tell you, just cut back on the read aloud books that you will read for the year. The CORE curriculum includes Bible, Read Alouds, Readers, and History. It comes with all the books you will need for these subjects along with instructors guides. The instructors guides give you structured lesson plans, comprehension questions you can ask orally and background notes related to the subjects your children are studying. You can also purchase Science, Language Arts, Math (Saxon or Singapore), and Electives from Sonlight, but they are not included in the CORE programs. Sonlight review tip - This way you can mix and match the subjects and products you want to use. I hope this Sonlight review has been helpful to you. If you need a homeschool coach, feel free to contact me. Or if you need some homeschool help, you can post a question at the bottom, of my homeschool questions page and I will personally answer your question.